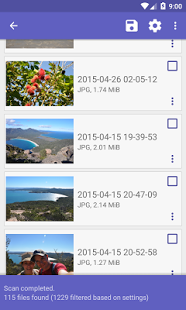 DiskDigger Undelete and recover your lost or deleted photos with DiskDigger! DiskDigger is an app created by Defiant Technologies, LLC (whose official website is http://diskdigger.org/android). DiskDigger has a rating of 4 on the Play Store, with 83220 votes. Similar apps are: Deleted Photos Recovery pro (by Yamoj Inc++), DigDeep (by GreatStuffApps), Recovery Deleted Photos (by Eos Mobile 2016), Restore Image (by AlpacaSoft), Undeleter (by Fahrbot PRI), Photo Recovery (by Tasty Blueberry PI), Super Backup: SMS and Contacts (by MobileIdea Studio). DiskDigger is currently available in the following countries: Peru, Switzerland, Romania, Israel, Turkey, Thailand, Germany, China, Japan, Denmark, Netherlands, Slovakia, Greece, Ukraine, United Arab Emirates, Poland, Estonia, Chile, Australia, Austria, Singapore, Indonesia, Czech Republic, South Korea, Colombia, Croatia, Serbia, France, United Kingdom, Sweden, Latvia, Lithuania, Norway, Finland, Hungary, Belgium, Hong Kong, Spain, Taiwan, Philippines, Malaysia, Russia, Bulgaria, India, Canada, Mexico, South Africa, Italy, Brazil, Portugal, Argentina, Saudi Arabia, United States, New Zealand, Egypt, Vietnam. - Improved support for older Android versions. - Fixed a few bugs/crashes. Have you ever deleted your photos by mistake ? You may be able to restore the erased images! *You can use all function in free!